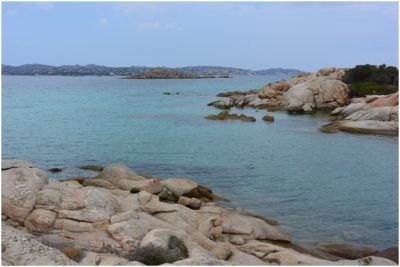 Archipelago of la Maddalena and Islands of Bocche di Bonifacio is part of the Tentative list of Italy in order to qualify for inclusion in the World Heritage List. One of the most beautiful beaches of Europe can be found in Sardinia - I guess I am not only person agreenig with this statement. I spent there my September holidays 2017 with suspicion I traveled to another planet... We explored almost all East Costline of Sardegna from Capo Testa to Capo Carbonara. I travelled to la Maddalena archipelago from Palau by ferry. Town of la Maddalena is quite ordinary, but it is not deffinitely true for uninhabited parts of the islands. Then we went to Caprera island, it is connected with la Maddalena with bridge - Ponte Moneta. From the bridge, we could see a couple of dolphins. Even though they appeared in rather fair distance from me, it was emotional experience. There are several marked track on Caprera island, so we would explore the vegetation (quite typical fro Meditterain) and walked to several beaches (photo) - ask locals which Spiaggia is the best in the area... For person prefering history to nature, there is also Tomba di Garibaldi on Caprera island. As the most interesting and significant features are hidden under see level, it is hard for me to fully recognize the qualities of the Archipelago. Definitly, the granite costline is unique. Unbelievable granite rock can be found in Capo Testa, some 15-20km from Palau (not included to TWHS). Therefore, I support the inscription. This would make an interesting transnational WHS. Rich flora and fauna and superb landscapes and history.